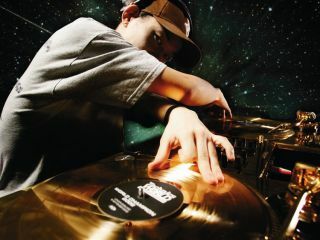 DJ Kentaro mixes up a hip-hop storm. Hip-hop is easily the most important new musical genre of the past 30 years - the level of its impact and influence can't be overstated. What began as an underground movement is now the sound of the mainstream. 1. Don't be afraid of grime. The Wu Tang Clan's first single, Protect Ya Neck, is one of hip-hop's nastiest sounding records from a production point of view, but the techniques are spot-on. It kicks like a mule and cuts like a knife - hence its all-time-classic status! 3. For the most part, you should keep EQ and effects to a minimum and pick the right sounds instead. 4. Decide early on how you want to process your vocals. Chorus, a little delay and some stereo spread can sound great on the right track, but don't feel like you have to use them. Trust your ears. 5. Try to acquire as big a music collection as possible. These are your sound sources. Jazz, funk, pop, soul - it doesn't matter what your records are, just that you listen to them with a careful ear. Is there a section where you can only hear that killer drum or horn? There usually is, so listen closely. 6. Don't adhere to any formula. If Snoop Dogg, one of the finest lyricists ever, can rhyme over a track without a bassline or kick drum in sight (Drop It Like It's Hot), then the sky truly is the limit. 7. Hip-hop was initially created by mixing other genres of music in a creative fashion. Now it seems as though hip-hop is feeding on itself and the creativity is gone. To bring a fresh approach to hip-hop production, listen to other genres of music. Try listening to some classic salsa or even tango. DJ Quick sampled some Indian music for a track with great results (even if he did to clear the sample! ), and Timbaland sampled an Arabic song, Khosara, for Jay-Z's Big Pimpin. Some fresh musical inspiration from ethnic instrumentation could be just what you need to bring those tracks to life. 8. Don't be afraid to let bass notes start before the kick occasionally. Hip-hop's meant to sound live - or at least groove-driven - rather than strictly quantised. "Hip-hop was initially created by mixing other genres of music in a creative fashion. Now it seems as though hip-hop is feeding on itself and the creativity is gone." 9. Try editing drum samples by sight and ear, without zooming in. This approximates the way samples used to be edited - on the E-MU SP1200 sampling drum machine, for instance. 10. Try reversing a kick drum and using a tiny element of it to lead into the main kick in your track. Used every few bars, this can create an excellent effect that really pushes the beat along. 11. Hip-hop usually needs big kick drums, so get layering! If you can think of a group whose kicks always, err, punch, sample one and layer it under your own. Many great producers have a couple of kicks they layer under everything - one for weight, another for punch. If done right, you can then layer a new kick over these two for every new track, giving a different sound but keeping the same feel. 12. Try playing in beats using a drum pad, or at least the keys on your MIDI controller, rather than drawing them in. And don't quantise the results entirely. Try fixing the kicks first, and any really badly out of time bits. But do it by moving the MIDI notes manually, and one by one - you never know what you'll find. 13. Try sending the MIDI notes of your drum pattern (or one generated by ReCycle!) to the wrong sampler or drum machine patch and checking out the results. Even if you only use part of it, there's lots of inspiration to be had, and plenty of classic beats have been made this way. 14. If you're struggling to analyse the groove of a loop on your favourite record, put it into Propellerhead's ReCycle!, import it into your REX player or sampler, match up the hits to MIDI notes and have a look at the placement. You'll be amazed how much difference tiny movements of individual sounds forwards or backwards can make to the groove. 15. Even when you think you like your beat, try removing random percussive hits and seeing if this makes it sound better. Cluttering a groove is a very common beginner's error, and even if you end up putting them back in, you'll have some ideas for edits and variations. 16. If you've constructed a beat across a few channels but it doesn't sound coherent, try running them all through one bus and compressing it - ideally with a vintage analogue modelling plug-in such as PSP Audioware's excellent VintageWarmer.